Most of these items I already had on hand from year’s past including the colorful patterned eggs from Red Posie, a local vintage shop. 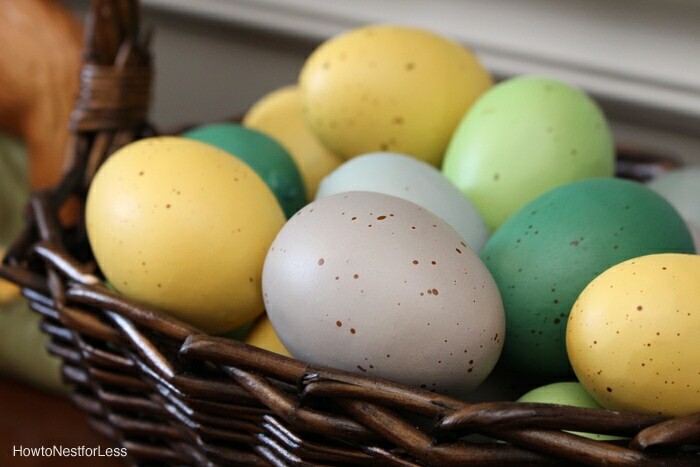 The speckled eggs I used throughout my home (I grabbed about 3 bags of these from Michael’s last year). I just love the colors used… not too pastel but still perfect Easter colors. 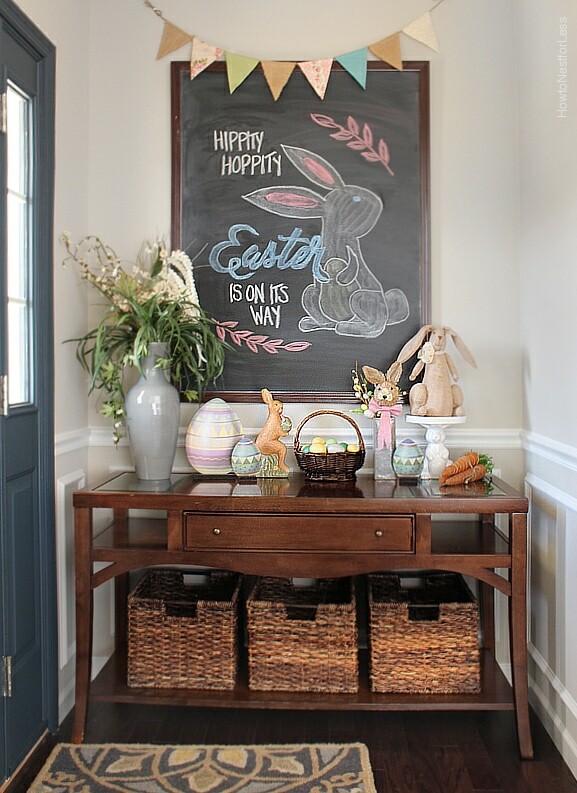 I think the only new thing I bought for our foyer besides the chalkboard is the big fabric bunny and the little white bunny stand underneath it. I didn’t go crazy in here, just little touches throughout. This room still has a long way to go with a rug and chairs, etc. 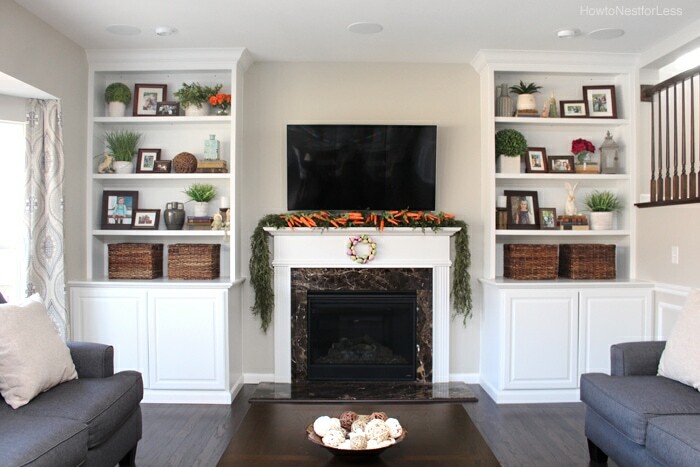 The biggest feature in this room is the fireplace mantel. I added an adorable carrot garland on top of my existing greenery. Then I hung a little egg wreath from the Dollar Store with a Command Brand hook. 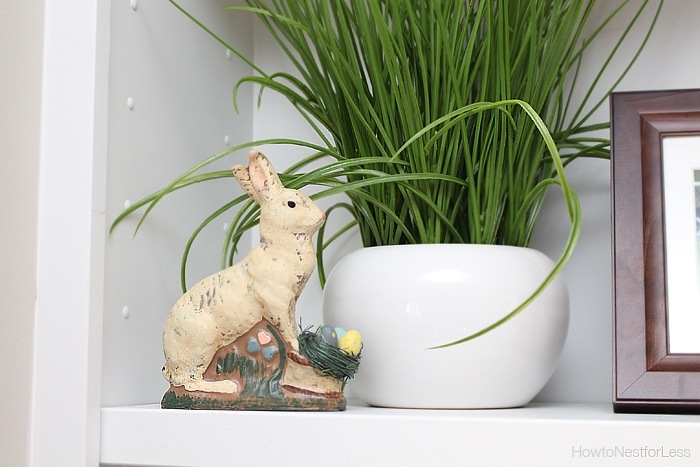 The shelves now have little splashes of Springtime with bunnies in various spots. I didn’t remove anything from these bookshelves from the first time I styled them, just added some small Easter décor to the existing space. I didn’t add much to the island. Just some cool metal carrots into the greenery. 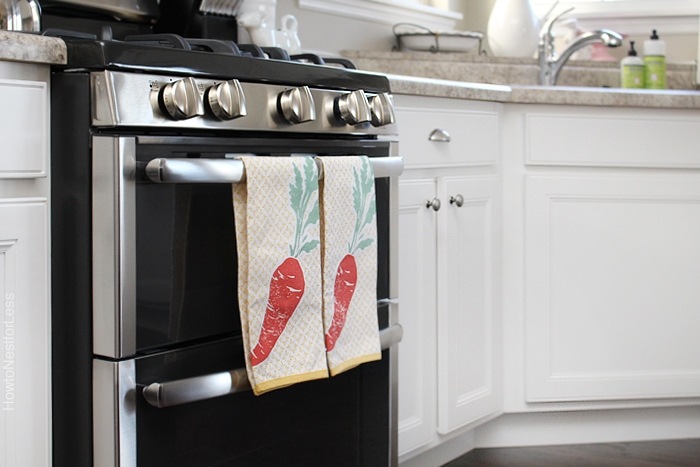 Then I put some carrot hand towels on the stove and one of my favorite Easter printables in a frame on the countertops. You can download this Easter Subway Art printable for free too! just little touches throughout our home. I think my favorite spot is the foyer with the chalkboard. 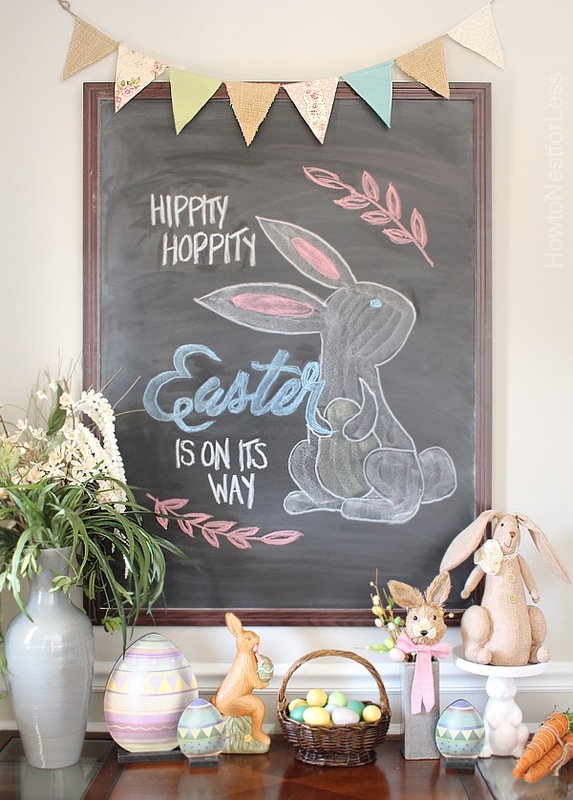 Get the chalkboard art tutorial here! The decorations look adorable Erin. I got the best laugh imagining what my chalkboard would look like if I attempted a rabbit! Hilarious. I think I’ll stick to the printables ???????? HA! As you can see the rabbit is a little wobbly in some areas but shading it in definitely helped. Trust me, I’m not going to get too complicated with these chalkboard designs. This was about as complicated as I can get without it looking like a Picasso. Cute & Sweet Erin. 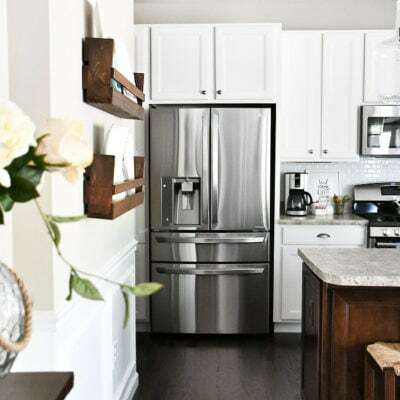 Good ideas all around – little touches throughout are ‘just enough’. May I ask where you got the carrot garland? Very cute! I just brought up my Easter stuff today. I have 2 metal bunnies that go in the yard. They are so cute, but they’ve lost their color. I need to run up and get some spray paint for them. I found a little one at Micheal’s today to go with them! 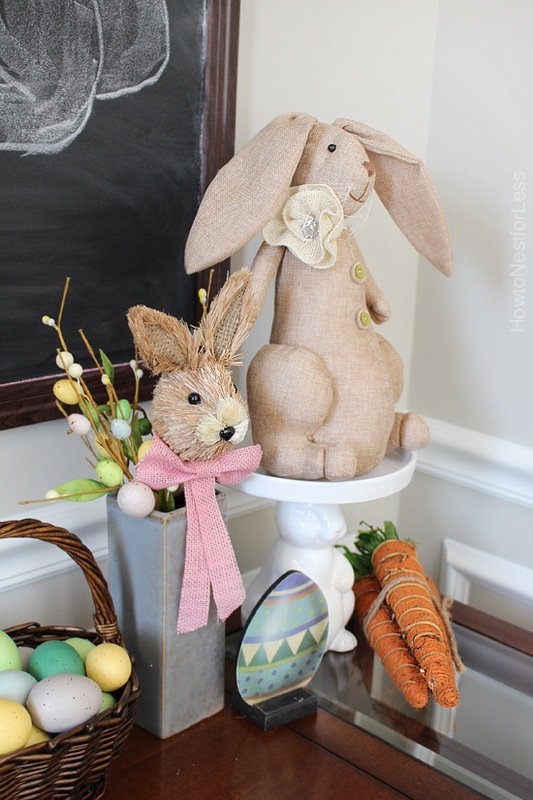 This is a nice blog with Easter… feel like home coming..
Love it! That Carrot garland is so stinkin’ cute! Pinning! Where did you get the bunny cake stand? That is way cute w/ rabbit on top of it. I adore your Easters on its way chlakboard art, dear one! 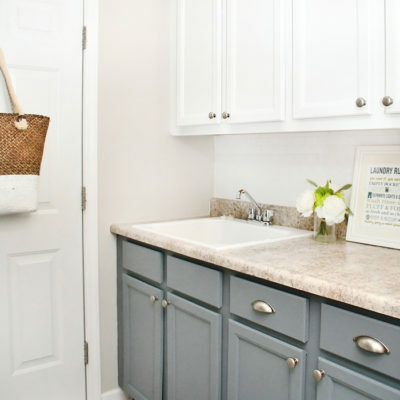 Sometimes little touches make the biggest impact! 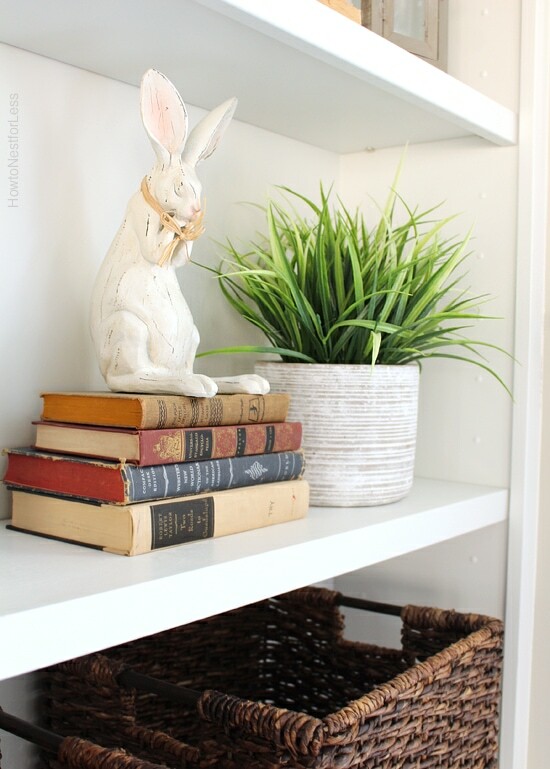 Adorable bunnies on your shelves with touches of grasses! Thank you so much, Pat. Your home looks great, definitely ready for Easter. And I adore that chalk board – what fun! – I want one! Oh my gosh – I LOVE your chalkboard art! You made it look so pretty! 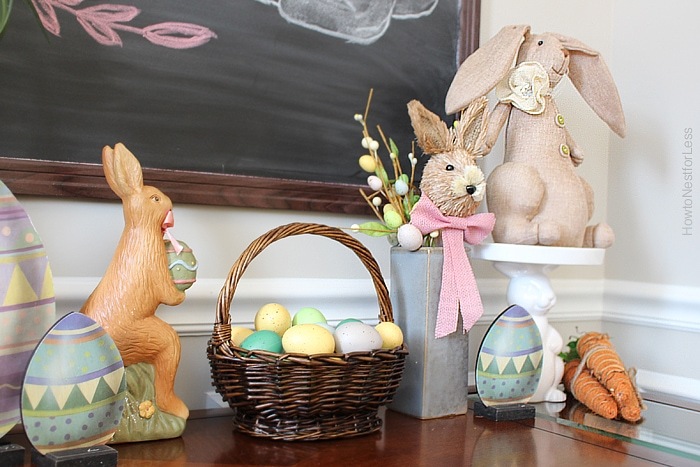 Thanks for sharing, I always get really excited to decorate for Easter. 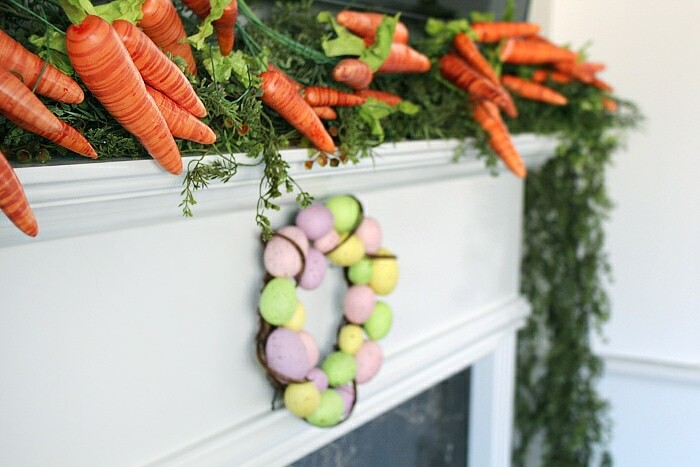 Love-love-love that carrot garland and the Easter bunny chalkboard! 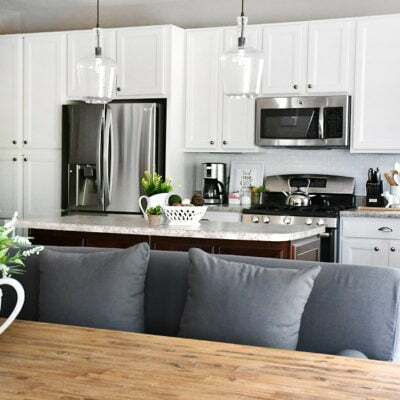 Your entire home tour is perfect for Spring and Easter. 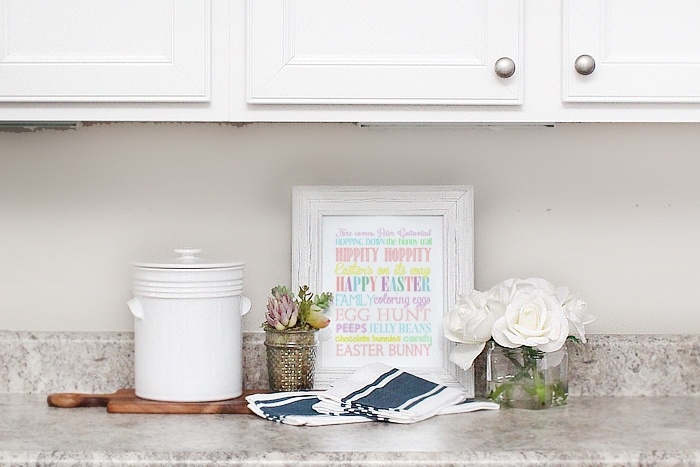 Love your beautiful Easter Home Tour! 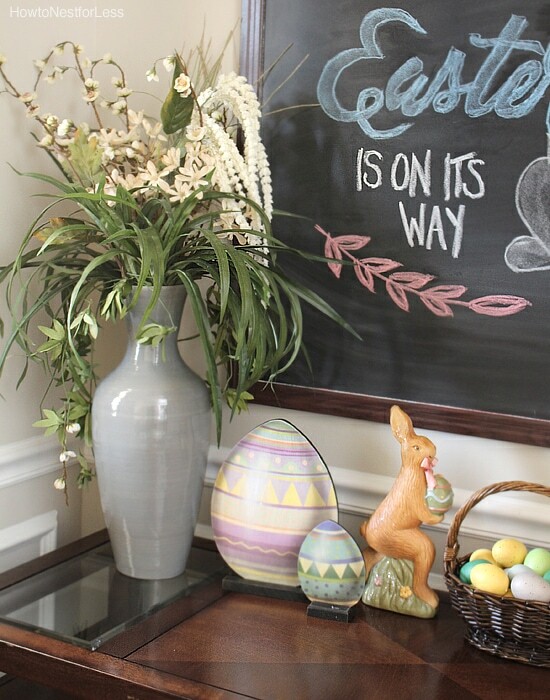 Your chalkboard art is just adorable & I love the mantel! 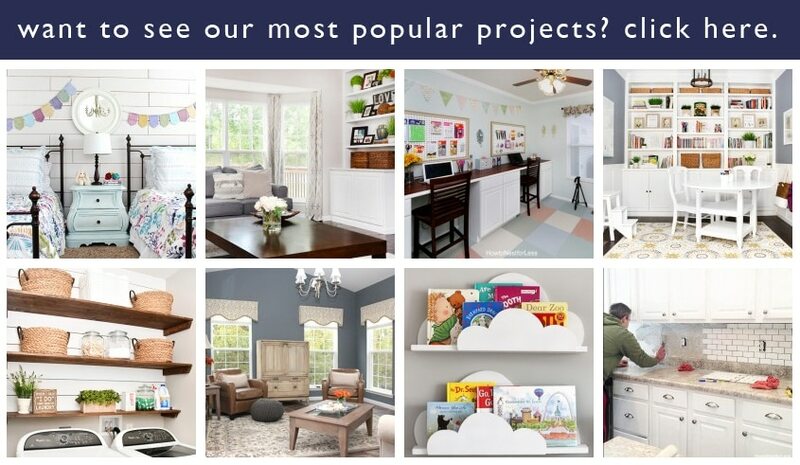 Thanks for sharing at #HomeMattersParty tweeted! 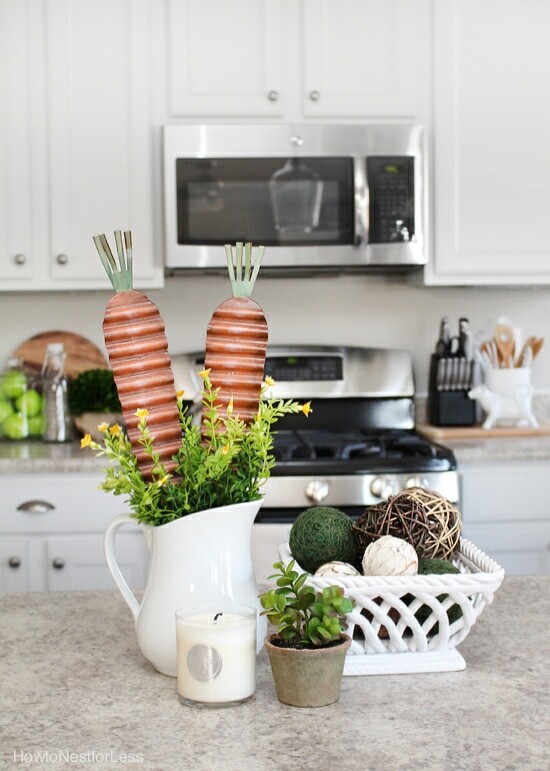 Love your Easter decor! Thanks for the tour!